When everybody stood shocked at AMD’s announcement of not just their Ryzen processor, but their massive Threadripper with a 16 core count. Everyone at this years Computex stood by waiting for the announcement of what they thought would be a 24 core Threadripper. At least that’s probably what Intel thought because they announced a 28 core. 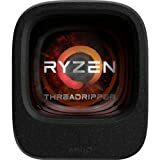 Once again AMD surprises everyone wit not just the announcement of Threadripper 2, but announces that the largest of the Threadripper family will be a whopping 32 core 64 thread beast. Threadripper’s 2nd generation is due top launch in Q3 of 2018 again following the launch of the second generation Ryzen processors. It will feature a 12nm and the Zen+ architecture. More importantly will not require a motherboard upgrade. The Threadripper 2 will fit straight into your TR4 socket motherboard and will only require a bios update. Delided the Threadripper hosts 4 8 core hot dies. Which just means all 4 8 core dies can be run at the same time and are connected via AMD’s infinity fabric. This allows all of the cores to communicate with each other and act as 1 big processor. AMD is continuing their success story with their latest processor architecture with not just high end desktop PC manufacturers planning to implement the Ryzen and Threadripper second generation, but mobile computing platforms planning to use AMD’s mobile Ryzen processors in their notebooks. This market has solely been dominated by Intel’s own processor line. After some of the controversy following Intel’s attempt to scupper AMD to the highest core count. AMD has certainly put themselves firmly on the top of the high core count processor race. Unlike Intel who had to use an industrial aquarium water cooler to get their processor to work. AMD can get their huge 32 core Threadripper 2 to run on an air cooler.